HI! I love the feature where I can create a receipt for Expensify directly from my web browser. However, this feature has not been working for me the past week. I click "create receipt from page" and the pop up says "creating receipt from page." I do not get another pop up saying your receipt has been created. It just keeps loading. Thanks in advanced! I also love this feature and also frequently have problems. Unfortunately, I have not necessarily noticed a pattern as to when the problems arise. 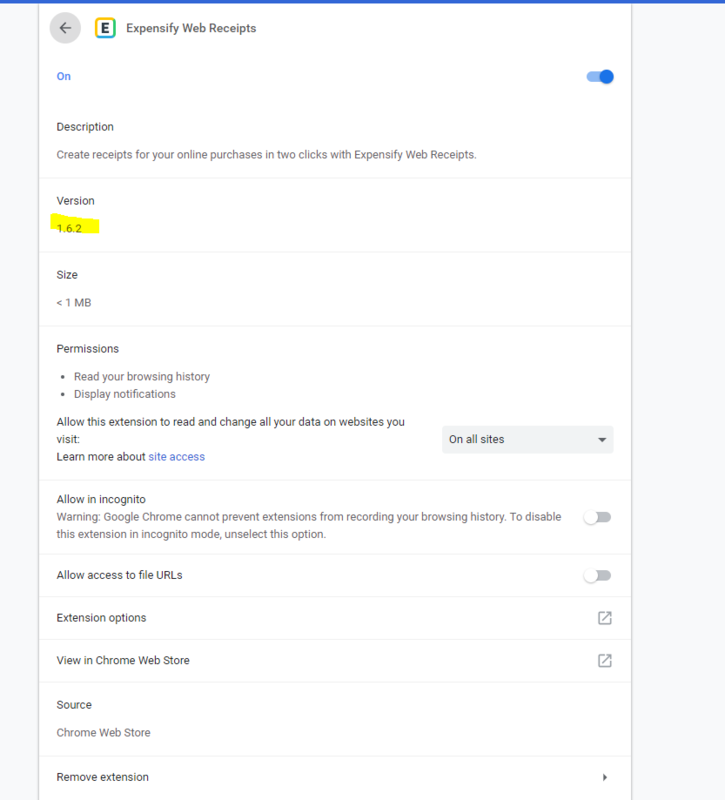 @LexiP @glglasser The chrome extension is a great easy way to create receipts in your account without having to screenshot the page and send it in manually. I know there are other extensions that can cause issues with the Expensify Web Receipts extension and it's not possible to troubleshoot all of these. That being said, we did just release an update on January 23rd. Can you confirm that your extension is version 1.6? I'll have my team take a look at the latest update to see if there's an issue there that could be causing this. Yes- I have the most up to date version. Thanks! Can you also let me know a specific website you were trying to create a receipt on so we can try to recreate the issue? I am trying to create a receipt from my email. I got emailed a receipt so I downloaded it and that is where I was trying to create the receipt. @lexiP What email provider do you use? Some sites don't allow this extension to create receipts so we want to check each website that this fails on. Thanks! Gmail does block our extension from creating receipts, however, you can forward emailed receipts to [email protected] Let me know if you have any questions!